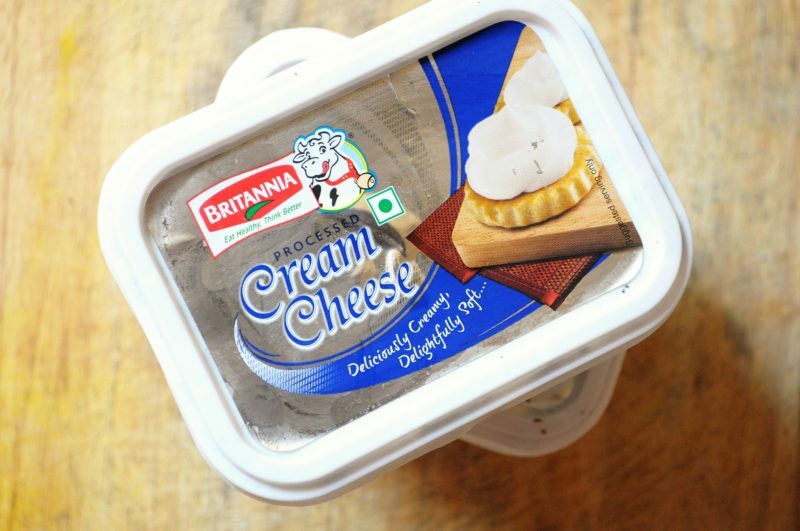 Today I am reviewing Britannia cream cheese. I have used this particular brand of cream cheese for over 4 years now and it has never disappointed me. I am a biggg fan of anything cream cheese! I could (hypothetically) kiss the hands of a good cheesecake maker and at the same time give a rough tongue lashing to somebody who is trying to pass off a gelatinous milk mixture for a cheese cake! And who doesn’t love an onion bagel with cream cheese! oh and nachos with cream cheese and spring onion dip! When I first spotted this cream cheese in India, I was in heaven! Cause till then , the only cream cheese I knew was the imported Philly cheese, which costs a bomb.I was so proud of Britannia for making this cream cheese cause I didn’t know there was a market for something like this here in India! This cream cheese has several layers of flavor.It tastes salty, cheesy,very subtly sour and creamy. It almost has the texture of the plain cheese spread or a just made cottage cheese. It’s a very versatile ingredient which can be paired with a number of ingredients. For desserts my favorite pairing is cream cheese and lemon and for savory my favorite combination is cream cheese and flaked garlic. I buy a bucket loads of Britannia Cream cheese when I spot it cause it’s not very easy to find. You will definitely not find it in your corner milk an eggs shop.You can most probably find it in Spar,Westside Gourmet,Foodhall,nature’s basket and sometimes in foodworld. I don’t want to blow my trumpet here cause this is about the product but you could keep my cheese cake (made from Britannia cream cheese) and any high-flying restaurant’s cheese cake and I kid you not, you will not be able to differentiate between the two and at times you might downright reject the restaurant’s offering. If you want to try a proper cheesecake in Bangalore I would suggest you visit either spoonful of sugar or berried alive. Most of the other places serve horrible gelatinous versions of cheesecake to cheat you out of your money!